Jacqueline's dynamic presentation about women's donor funds was inspiring and suggested a simple approach designed to make an impact in the community with no fundraising events, no tickets to sell or tables to fill, no required volunteer commitment. Instead, it provided a way for women to grant larger amounts of money to local charities by pooling their charitable donations. Realizing this philanthropic model would appeal to other women in the community, Carol, Meredith and ten Founding Members developed the basic framework to create a local donor fund. They approached the Santa Barbara Foundation for their expertise and guidance on launching this new organization. 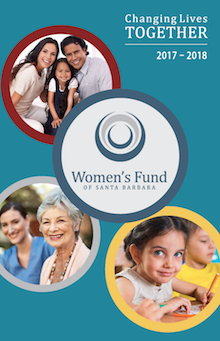 In 2004 the Women’s Fund of Santa Barbara was born as a Field of Interest Fund of the Santa Barbara Foundation, which means that the Foundation handles all the financial transactions of the Women’s Fund and serves as its 501(c) (3). The hope that first year was to raise $50,000. Founding Chair Carol Palladini reported, "When we raised $140,000 fairly easily, we KNEW this was an idea whose time had come!" In 2006, the Orfalea Foundation approached the two-year-old Women's Fund of Santa Barbara with an exciting offer. Because they liked the collective giving concept and the quality of the Fund's volunteer-driven research, and to help attract more members, Orfalea offered to match Women's Fund member donations. For three years, the Orfalea Foundation helped double our growth by donating more than $900,000 to the Women's Fund. In 2010, Women's Fund member and local philanthropist Betty Elings Wells surprised us with a $250,000 matching grant to stimulate increased giving and enlarge the pool of funds available to award to local nonprofit agencies. In 2012, Betty announced a second $250,000 matching grant, bringing her total to more than $500,000 over four years. In 2012, we created the Women's Fund Endowment to support our mission and to offer members a vehicle to make larger or longer-term gifts, such as appreciated assets, bequests or memorials. The Santa Barbara Foundation remains our partner as well as our fiscal home. Their advice and support over the past decade has been invaluable. In 2014 the Santa Barbara Foundation generously underwrote the development of our new database and website, in addition to designing our 10th Anniversary Brochure.